VANCOUVER, BRITISH COLUMBIA--(Marketwire - Dec. 9, 2009) - Editors Note: There are 2 videos, 1 photo and 6 audio files associated with this Press Release. Molson Coors Canada is pleased to announce today it has teamed up with the Four Host First Nations (FHFN) and the Vancouver Organizing Committee for the 2010 Olympic and Paralympic Winter Games (VANOC) to launch a new online donation program that supports the Vancouver 2010 Aboriginal Youth Legacy Fund. Canadians from coast-to-coast-to-coast can pledge their support online at blog.molson.com/community/shop and with a minimum donation of $10 they will receive a First Nation-designed 2010 collector pin. 100% of the proceeds will go directly to the Vancouver 2010 Aboriginal Youth Legacy Fund. "We've kicked off the campaign by providing 5000 uniquely-designed pins with the goal of raising $50,000 for the Fund," said Ferg Devins, Chief Public Affairs Officer for Molson Coors Canada. "Now Molson Coors is calling on Canadians across the country to go online, make a donation and help support Aboriginal athletes for future generations." "Today's announcement puts words into action," said Tewanee Joseph, Executive Director of the FHFN. "This innovative online donation program will provide significant support for the Vancouver 2010 Aboriginal Youth Legacy Fund and represents another Games achievement for the Aboriginal Peoples in Canada that will serve as a lasting, iconic legacy of the 2010 Winter Games." "VANOC's goal is to achieve unprecedented Aboriginal participation in the Vancouver 2010 Olympic and Paralympic Winter Games," said Dave Cobb, Executive Vice President and Deputy CEO of VANOC. "Through this ground-breaking partnership, we have set the bar higher than ever before, and it is our hope that future Organizing Committees will be inspired and learn from our experience." Created by First Nations designer Glenn George, the pin's artwork includes an illustration of the sun rising high above two mountain peaks. The sun is meant to give life to the Mother Earth, while the mountains, commonly known in Vancouver as "the Lions," represent protection. The Vancouver 2010 Aboriginal Youth Legacy Fund has been created by VANOC and the Four Host First Nations to support sport, culture, sustainability and education initiatives for First Nations, Inuit and Metis youth Canada-wide. 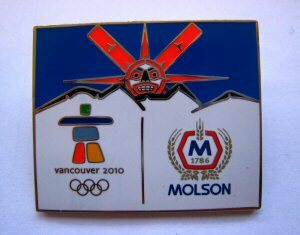 Inaugural Molson Coors Canada/Four Host First Nation-designed 2010 collector pin.